Unless you’ve been hiding under a rock or are completely new online, you’ll know that graphics help SELL a product. I don’t care what you’re selling – words alone can only do so much, but graphics will help your visitors decide if they want to stay on your website and read your sales copy or leave there and then. Hire a freelancer and get someone else to do it for you? – It’s a very sensible choice seeing as there are many professionals on there that can provide you with decent mini-site graphics. We’ve created 100s of mini-sites over our time online. So much so, that it’s become second nature. What does that mean for you?... It means you can start putting your products online quickly, without fuss about what to do about those graphics and then reaping the benefits of more leads, sales and higher conversions! You’ll also receive the PSDs and fonts that will allow you to add your own product name or domain name onto the templates. "This Is TRULY A Money Saver!" I simply love the Heavy Metal Marketing graphics! Seriously, this product was an absolute necessity for me after I had looked at my monthly Elance expense report! I simply couldn’t afford to keep paying designers (even if they were reasonably priced) for the enormous amount of graphics I needed for my sites. I simply had to find a better way to create great looking graphics without incurring the great expense. I mean, a small “Buy Now” button cost me $15. Not much, but when you add other graphics such as “Contact Me” or “Add To Cart” or “Promo Code” or “Check Out,” you begin to see how $15 here and $25 there all add up! Any decent page could have up two 15 graphics on it – usually more! How much money is that? 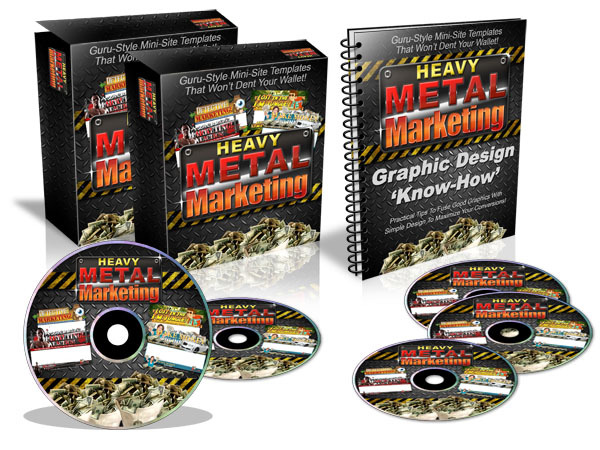 With Heavy Metal Marketing I am saving tons of money. You've saved me the two things I need the most in life – time and money. After buying the product, I didn’t have to spend money to pay someone to create the graphics I needed for my company’s two websites. The library of graphics will also allow me to mix and match perfectly as we move forward with new and fresh content and photos. After purchasing your product I was immediately able to download the necessary files and basically drop them into my website with absolutely no problems at all! It was perfect, actually. My company is launching a new product line soon, which will be marketed to an entirely different type of consumer and I will also employ these graphics to the new site – saving me even more money! Seriously your graphics are so easy to use and had provided me so many extra graphics that I was able to start up a couple of new websites for my own products translating to increased sales! In fact, I had a few domain names sitting around doing nothing because I didn’t have much cash to get the sites up and going. But, then I purchased your graphics to clean up my current website and thought I could use it for the other domains I had. The graphics worked perfectly! It did such an amazing job and saved me tons of money that I am now using those previously dormant sites to make extra sales! Thank you! The easy to use format, with rich, high quality graphics is exactly what I needed to bring my websites into the 21st century! You can rebrand your existing product that’s not selling so well! – You may already have your own product that’s running live on your server right now. Problem is, is it really pulling in the sales like you hoped? If not, it may very well be down to your presentation! By simply rebranding one of the graphics packages to match your product name, you’ll instantly have a new site that you can be proud to promote! You can rebrand your old PLR product! – PLR is useless just sitting on your hard drive. You may have it set aside in a ‘to work on later’ folder but the fact is you’re put off from the amount of work you’d have to go through into order to bring it to life! Simply choose a graphic set and rebrand with your new product name and you’ll finally have your new PLR product that you invested in making money for you, rather than costing you! These are just a few ideas to get you started! These website graphics have so many uses and value in themselves that it will cost you NOT to have them! These templates are so versatile and reach out to a variety of sub-niches and cater to different people that you’ll be able to start making money with them in no time! And with your Master Resell Rights license and reseller’s kit you’ll be able to recoup your investment several times over no sweat! I will not bore you with a price list of how much it costs to create these graphics, but let me tell you now, it wasn’t cheap and it took many man hours to create. So before you scroll down to peak at the price, just remember that it costs $300 upwards for a ‘decent’ graphic set. Simply place your order below and you’ll be forwarded to the download page where you’ll get access to all 10 one-of-a-kind graphics templates that will result in more leads, more sales, more affiliates and more traffic! YES Charles! 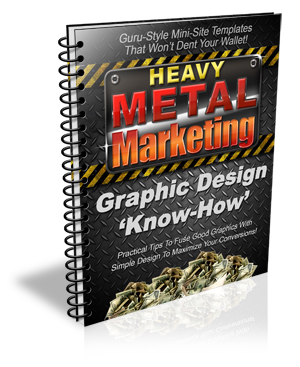 I understand that I will be getting access to 'Heavy Metal Marketing' straight after payment and will be able to download my graphics right away! YES! Charles I understand that if I'm not happy with the course or still can't make more money from using it, I can simply ask for a refund even 60 days from now!